"The document that is always becoming." A Ketubah or Brit Ahuvim (Promise of Partnership) artwork sets a symbolic tone for the home you build together with your partner. The language and imagery can illuminate the role of intention in your partnership. 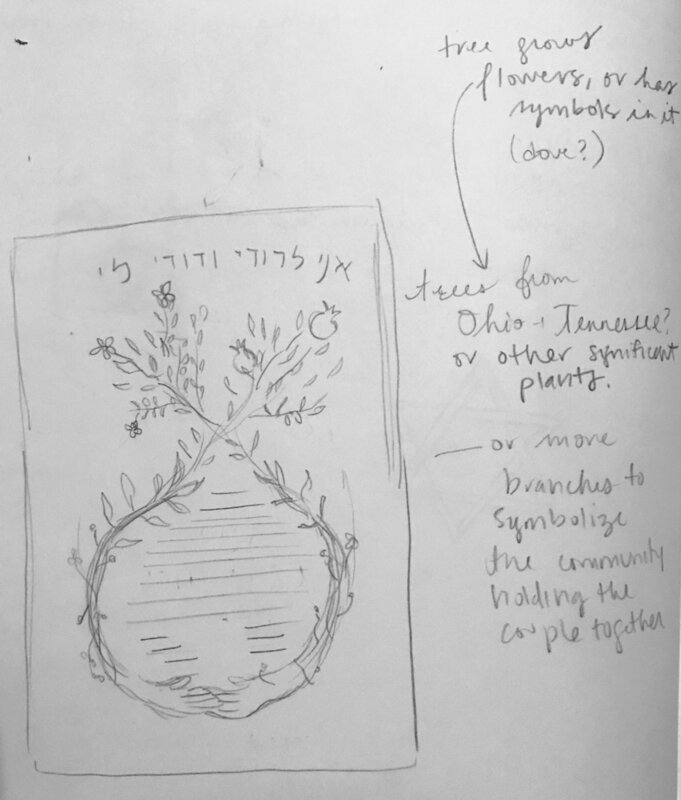 A Ketubah, like any work of art, is made through a process of exploration. While a wedding is one special day, a Ketubah stays with a couple over a lifetime, and is often shared as a family heirloom over the course of generations. Marriage contracts are found across cultures, and I proudly create them for people of all faiths, genders, and sexual orientations. My favorite part about making ketubot is getting to know my clients. Once we decide to work together, we will engage in an open conversation about your aesthetic, intellectual, and cultural interests. With your help, my goal is to manifest visually that which is in your hearts and minds (even if you don't consider yourself a "visual person"). The end result is a meaningful work of art and a reminder of the reasons you choose this partnership day in and day out. Scroll down to learn more about the BSP process of crafting ketubot. Visit the Ketubah Gallery to see past works and be sure to check the FAQ page for a breakdown of the timeline, process, and cost estimates. Ready to place your order? Choose from a limited edition print in the SHOP. Once you've purchased the ketubah of your choosing, fill in the ketubah survey form and return to info@batsarahpress.com. Do you have a question or are you interested in commissioning a custom ketubah? Send me a personal message. 1. Once custom ketubah clients pay an initial deposit through the SHOP, they fill in the custom ketubah informational survey. The client responds with the filled in survey and images or a link to a Pinterest board (see the Bat Sarah Press Pinterest page to start building yours). 2. A contract is drawn up to lay out the terms of creation and payment. If I do not receive the signed contract within one week I will assume the project is not going forward. When the contract is signed and returned, I will reserve 6 weeks for production of your artwork in my studio calendar. 3. When your reservation time arrives, we will convene to discuss ideas. Then, I will create 3 initial loose sketches based on your order form requests and the visuals you share with me. Following approval of one chosen layout design, I will create a tighter sketch and finalize your text. You will have one week to request changes on the design for up to 2 hours of labor free of charge. After the two hours of included design edit work, I charge $40/hour for additional edits. 4. Once the final design is approved, your artwork is created. When complete, it is packaged along with an official Bat Sarah Press certificate of authenticity. Please allow 6 weeks for giclée template design orders and 12 weeks for handmade template orders. When ordering a customized or fully custom ketubah, please allow at least 4 months for production but up to 6 months advance notice is preferred. Depending on availability, rush orders may be accepted for an additional charge of $100. Please send an email of interest to info@batsarahpress.com to begin the conversation. Custom ketubot start at the base price of $1,000 USD. Customizable designs inspired from the Ketubah Gallery and available in the SHOP start from $225-800 USD. and shipping costs may increase the base price. The available Ketubah designs may also be altered at a rate of $40/hour or a flat project rate on a case by case basis. Additional details about pricing can be found on the FAQ page.